You might be amazed at the paint you can scrape outta that there roller. Then wash the roller out good and save it for next time. If you're not done painting, and want to come back to it tomorrow, wrap it in plastic wrap or a couple of grocery bags, making sure no air can get to it. I have done this and come back to it several days later and it was still as fresh as ever. If you use paint a lot, it's nice to keep lots on hand so you don't have to make a special trip in to buy it when you want to use it AND you won't have to pay full price. Every time I walk into a Lowes, Home Depot, etc. I always check out the mistints or "oops paint". Often it is high quality paint for a fraction of the cost. Above is a can I just snapped a pic of from my shelf - as you can see it was regularly $26.98 and I paid a whopping $5.00!! 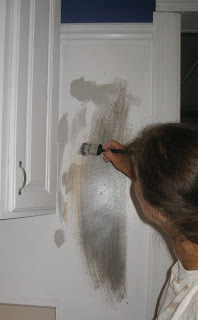 You can often find shades of taupes, whites, blacks.... which brings me to my next tip: Mixing your own paint color!